One white and one red towards-festive bottles: 2008 Grüner Veltliner Pfaffl (goes to "wotm" 2005-10 page) and 2007 Elégant Carignan Mastrió (takes you to their blurb on FMW). Pascal Rossignol (which means nightingale, pic.) and his wife Fabienne have 25 hectares (62 acres) of vineyards in Les Aspres zone just outside the village of Passa, west of the A9 motorway between Perpignan and the Spanish border. Originally co-operative growers, they decided to do their own thing and built a cellar and visitor centre a few years ago to focus on quality estate wines. Update 2009/2010 I went to see the ever cordial Pascal and Fabienne in mid December 09 to catch up and taste their latest releases. Having started down the organic pathway a few years ago, 2009 is their first certified organic vintage. Plus the latest medal winner is HERE (World Grenache Competition 2013). Route de Villemolaque, 66300 Passa. Tel/fax: 04 68 38 83 17; domaine.rossignol@free.fr, domainerossignol.fr. This wine went pretty well with brandade de morue (salt cod + potato + olive oil + garlic mash) tonight, admittedly a frozen one but still tasty: 2005 Domaine Mouscaillo Chardonnay from the hills south of Limoux, western Languedoc. Vertical tasting notes (2004 to 2008) plus estate profile on my other blog. Champagne Gosset has launched one of those "luxury positioned" (like perfume or posh luggage) champers just in time for Christmas! This "limited edition special cuvée" (well, you'd hope so really) is "a blend of 12 Grands Crus and Premiers Crus from 2004 and 2002." I'd imagine it's very nice and must be a bargain (not) at £85 (unless a British supermarket gets hold of it and allegedly starts giving it away along with those other too-good-to-be-true offers flying around). Mind you, since it's banker bonus season again, no doubt posh champers like this will be flowing merrily anyway. As well as "the huge amount of information now free to view on our website," explains owner & publisher Wink Lorch, there's a special discount on Gold Membership (allows you unlimited access including downloadable PDF files of all guides, which aren't free) running until 9th January 2010. Simply "use the promotional code D2GIFT1209 to purchase Gold Membership for only £20 (around US$34) instead of £29. Copy and paste it into the box on the "Gift Membership" page and click enter." So, get planning that wine and food trip now! Guides cover most of France's wine regions plus Tuscany and Rioja. I'm the contributor/writer for Languedoc & Roussillon, by the way, just to state any "interest" if there is any as such (I'm freelance not an employee, I mean). Go to www.winetravelguides.com. This was the title of Tim Atkin MW's column in UK drinks retailing fortnightly Off Licence News on 20th November. In quick summary: sommelier, wine guide author and TV personality Matt Skinner appears to have got his fingers burnt in his just-released "the Juice 2010" by recommending "a number of New World wines from the 2009 vintage that he could not have seen before the book's deadline in May." His defence was "...some of the wines he included... are consistently good from year to year." I don't know Matt nor have I read any of his books, but Tim's quite right to point out that he's on rather dodgy ground here in retaining credibility with readers. But what grabbed my attention more is the "excuse" forwarded by the publisher: "this was a way to get around long lead times and potential public disappointment," as in the past apparently "several of Skinner's choices had sold out before the book hit the shelves." Indeed, talk about accidentally admitting this style of paper guide now seems more or less pointless, thanks to the traditional publishing process itself! As Tim concluded, "Why not put the whole thing online to make it more immediate and up to date?" Then again, if you're reading this and agreeing, you already know where the future / present lies for wine writing! "Updated regularly or occasionally as fits the mood...not exactly a wine of the week or month but could be...hopefully more spontaneous than that..."
I've just posted my latest Wines of the moment: click on that link and scroll down to Dec. 2009 for a few groovy winter finds: 2008 Rasiguères rosé - 2008 Pinot Noir Rotisserie - 2005 Carinyana Puig-Parahÿ. Anybody tasted these recently or anything similar? The lost wee village of Roquetaillade really does feel like it's at the end of the road/world, perched up in the handsome hills south of Limoux at the southern end of the appellation area. There are a few good producers based around here including Marie-Claire and Pierre Fort at Domaine Mouscaillo (some of their vines border Domaine de l'Aigle, for example, now owned by the Gérard Bertrand group), whose 4.5 ha/13 acres of vineyards climb up gentle slopes to 400m/1300 feet in altitude. Mainly two varieties and two exposures: the Chardonnay faces north and the Pinot Noir south, more or less (the surging terrain here isn't as black-and-white chiselled out as that). There's "a tiny bit of Chenin and Mauzac too," as Pierre explained on my visit in December 2009. 09 "younger vines" Chardy - lovely grapefruit and spicy floral notes; turning bready and creamy vs juicy and dry, just a touch of fresh acidity on the finish. 09 "older vines" Chardy - touch toastier and more structured, more powerful too yet with mineral bite, juicy citrus fruit and nice length. 09 "old vines" Chardy (malolactic fermentation done) - richer with more prominent yeast-lees notes vs again attractive juicy citrus zest, then more buttery on the finish vs finer acidity. 09 "old vines" Chardy (no malo-lactic) - much crunchier and fresher with pure lemony fruit, nice bite and length. These lots of Chardy all end up in the final blend, in differing proportions, as Mouscaillo only does one label. 2009 Pinot Noir (older cask) - attractive perfumed cherry and spicy notes, expressive Pinot style; touch more savoury on the palate with freshness and light grip. 09 Pinot Noir (new barrique) - more structured and firmer tannins, spicier but still has plenty of Pinot character and depth too. UPDATES: latest vintages etc. here (Limoux report, April 2011). 6 rue du Frêne, 11300 Roquetaillade. Tel: 04 68 31 38 25 / 06 78 93 37 61, mouscaillo.com. UPDATED DEC 2012 (see below). It's true that some European wine estates like to brag about how long they've been messing around in vineyards, but I've not come across (m)any who claim to have records going back to 1446! Latest generation is the charming Georges Puig (pictured), who's been running the show here since 1994. The estate takes in lightly elevated (sloping up to 200-250m altitude) vines old and new all around Passa in particular spots called Fort Saint-Pierre, Sant Lluc and nearby Mas de Miserys (sounds suitably Catalan, dour I mean. Oops!). The Puig-Parahÿ family has the most extraordinary collection of old Rivesaltes VDN wines imaginable - as you'll see from the 1945 below, although the "catalogue" apparently goes back into the 19th Century. Some in bottle, some in vat and some still in cask, as I discovered on a delightful little tour (of history too it felt like, especially as you get the impression Georges' family owns, or used to own, most of the village). Georges has good distribution in the US (Village Wine Imports NYC and also Virginia, Colorado and California: email him for details), UK (Richards Walford and Rare Wine), Tokyo (the Vine) and Germany. 1971 Rivesaltes red - treacle and molasses notes with dark brown/orange tinges, roast walnuts and wood resin too, a tad dusty perhaps (or was that the glass? ); rich and sweet vs meaty oxidised, long and unusual flavours, again cough mixture with dried spice undertones. Odd but good! 92+? 66300 Passa. Phone: 04 68 38 88 77 / mobile: 06 14 55 71 71, g.puigparahy@free.fr, www.puig-parahy.fr. 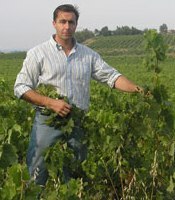 Apart from their all-encompassing Rhone Valley presence and portfolio (just about everywhere from north to south), Michel Chapoutier has his largely organic/biodynamic fingers in other pies, notably the Roussillon (see link below), Australia (Victoria and South Australia) and Portugal (Estremadura). However, the company is perhaps best known as "the biggest landowner in Hermitage," as it says in their corporate blurb, that somewhat sought-after appellation where they have 34 hectares/85 acres. So, they make a few different wines sourced from these revered, and pretty awesome hillside vineyards. The two below, tasted in December 2009, fit into their 'prestige' range meaning they're Chapoutier's most famous, and dearest, Hermitage "cru" labels: the white comes from three plots with different soils and aspects called "Le Méal", "Les Murets" and "Chante-Alouette" itself; and the red from "Les Bessards", "Le Méal" and "Les Greffieux." Click here for a couple of Chapoutier's Roussillon reds and here for a bit of Crozes stuff. Not surprisingly, their wines are well-distributed around the world. More @ www.chapoutier.com. Cédric Saur's family owns and runs the quite well-known Château Haut-Fabrègues near Cabrerolles, found in the middle of nowhere in deepest Faugères country. La Grange d'Aïn is Cédric's baby, 12 hectares (30 acres) of plum old vineyards planted with Grenache, Carignan and Syrah and farmed organically. He's making some pretty serious reds showing lots of fruit extract, big tannins, power and occasionally oak. Nevertheless, they're very well-made, tasty, full of character and obviously built from true quality fruit and a hand-made approach, rather than just show-stopping competition wines you wouldn't actually want to drink. These three were sampled at the Millésime Bio organic wine show (Perpignan Jan 2008). More info to follow as he's definitely on my Faugères-visiting list (along with another dozen or so...): see below below in fact! 2003 Les Mimosas (old vine Syrah, 4 years in barriques!) - plush oily raisin fruit coated with lots of coconut tannins; the wood is a bit intrusive and overall the wine a bit too extracted, but it's certainly impressive and quirky. 87-89? Update: I called in on Cédric on a dull and cold November's day, 2009, and tried the latest vintages. We talked a little about it really means to "go organic", and he said some interesting things apart from the obvious "environmentally friendly" reasons. 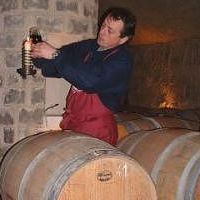 Briefly paraphrased, the most important shift in thinking for him is "the way it made/makes him look at growing grapes and making wine in a totally new light... once you remove that guaranteed efficiency (from synthetic products)," Cédric mused, "you have to work the vineyard in a very different way." Basically, much more plot by plot watching and analysing how each variety or vine reacts in each location; whether there's a problem and how to deal with it, or whether you should just leave it alone. Food for thought... La Grange d'Aïn wines are now quite big in China, I'm told, as well as certain Paris restaurants. Fontanilles, Lenthéric near 34480 Cabrerolles. Tel: 06 12 10 31 02, cedricsaur@hotmail.com, www.cookandwine.com. 2007 "Vieilles Vignes" Faugères (Grenache, Carignan 14%) - smokier and quite complex, very ripe then turning savoury/tobacco-ish; attractive dry texture vs lush maturing fruit, then closes up on the finish. €8.30 88+? Latest Liquière vintages tasted here ("Faugeres Focus" April 2011) and here ("2009 vintage report" June 2010). Liquière wines are available from the Wine Society in the UK; and via Bonhomie Wine Imports, New Jersey, Ideal Wine, Boston, and also in California. La Liquière, 34480 Cabrerolles. Tel: 04 67 90 29 20, www.chateaulaliquiere.com. "Côtes de where? Not the favourite coastal or riverbank hang-out for Jean-Luc Picard's scariest enemy, but a lesser-known 'Right Bank' Bordeaux appellation. Somehow, it's surprisingly easy to get your geography in a twist on this side of the river and forget you're actually opposite Margaux 'just across' the water..."
There are more children (see 'Les Enfants Sauvages' too) found a little up the hill in Maury off the Cucugnan road (almost next door to Dept 66): Swiss-owned Domaine des Enfants is another great-potential 'start-up' estate. When I called by in late 2009, Marcel Bühler was brewing up his third vintage in his compact cellar, formerly owned by Serge Rousse (of the sadly defunct Domaine Terre Rousse). This was gleaned from 20 ha (50 acres) split across seven sites (half the vines around Maury plus Caramany, Cassagne, Rassiguere and Latour-de-France) with a variety of soil types (schist, granite, gneiss, 'terra rossa'...) and alarmingly low final yields of eight hl/ha. "We pick late then really select through (the fruit)," Marcel clarified, "we must've chucked away a quarter of it this year. 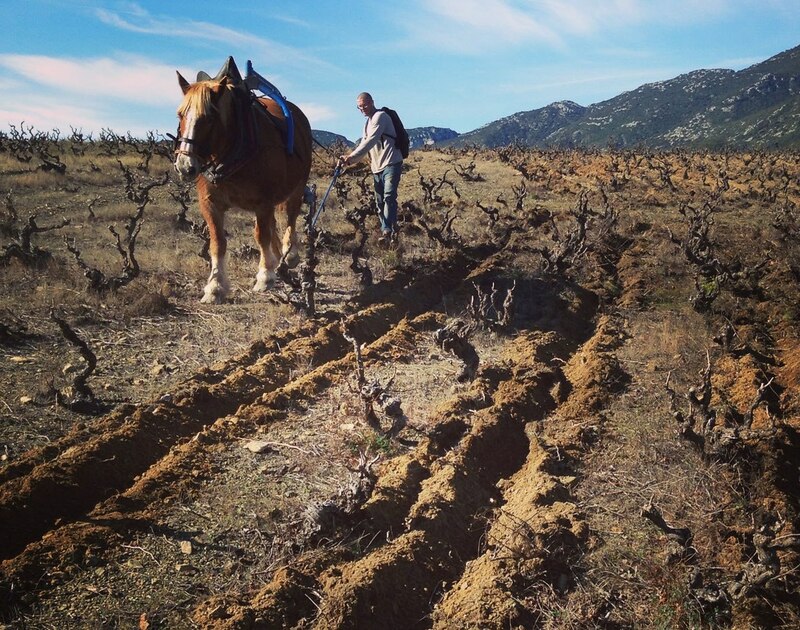 Everything's very manual as the vineyards are old, so I've got two horses... No herbicides are used and I'm going for organic certification in 2010." Route de Cucugnan, 66460 Maury: www.domaine-des-enfants.com where I pinched the photo from. What's all this English then, you might be wondering? Bit of a giveaway but the name has a certain ring to it. The people behind the Bee are Justin Howard-Sneyd MW "biggest nose" (I quote from their website), aka former head of Waitrose wine buying then Direct Wines/Laithwaite's, and long-time enthusiast for south of France wines; Philippe Sacerdot "biggest brains" and Justin's wife Amanda "biggest hair." Back in 2003, a second family trip to the Maury area (so the story goes...) instilled a minor obsession to buy a few plots of vines, which now total nearly 4 hectares of old Grenache and Carignan, "about the size of 5 football pitches" (not being a soccer type, it never occurred to me to use that comparison to explain ha but it does the trick). These exposed (big wind and sun) vineyard parcels are managed by Richard Case at Domaine de la Pertuisane, who also makes the wine at his / American partner's new mega-winery up the hill from Maury (more on that to follow...). I say 'wine' as there's only one so far, hence the single tasting note below on the promising 2007 vintage. Before that, the grapes went into various Pertuisane wines. There's a lot of blah blah said about yields in this area (and just about everywhere really), but they sum it up quite neatly on the site referring to quantity produced in 07: "Imagine a square 4 metres by 4 metres with one bottle sitting in the middle. That's roughly the yield that these ancient vines give us." Anyway, this translates as the wine costing £16-£20 a bottle depending on how many and whether you buy it in the UK or France. More details from www.domaineofthebee.com, where there's even an honest FAQ justifying "why is it so expensive?" I like your nerve! UPDATE: November 2011. Click here for the latest buzzings-on at the Bee camp including a note on their recently released and rather tasty 2009 vintage red. More updates to follow e.g. the Bee has since moved wineries to Chateau Saint Roch just outside Maury. The award-winning wines gleaned from this annual French Catalan taste-off were this year (2009) billed as "the finest representation of the Roussillon region," which it probably isn't although for sure there are some good wines to pick from here. As in any competition, the winners are only as good as the wines submitted in the first place and, I assume as I don't know what the original 'pre-selected' line-up was, it appears the majority of the Roussillon's best growers and winemakers didn't/don't actually enter the Saint-Bacchus. Why don't they? Instead of moaning that it's a PR stunt for co-ops and big wineries (paraphrasing what I've heard from more than one source, and admittedly there's apparently a minimum volume requirement for any wine entered), they should put their wine where their mouth is, so to speak, so in the end it does truly represent "the region's finest." By the way, this rant certainly isn't a criticism of the tasters (I know and respect some of them) nor judging process; wine judges can only give their verdict on the bottles put in front of them. Just a missed opportunity maybe due to local wine politics! So, why not allow any wine regardless of the quantity available? Talking of judges, just to fill you in a little on how the competition works... 158 wines out of 327 submitted (see what I mean, not that many) were singled out in Perpignan last April by local winemakers, sommeliers and wine merchants. These were then sent to London the following month to be tasted blind by an "international" panel (eight different nationalities I'm told) at the Maison de la Région Languedoc-Roussillon (yes, they've blown a load of money on some swanky premises in the West End), who picked 21 winners. I tasted all of these in September 2009, not blind and mostly in the kitchen over dinner by the way! See my notes & reviews opposite, for what it's worth... Many thanks to the CIVR (Roussillon wine industry body) for the samples, who are doing a bit of a St-Bacchus autumn road-show around France and further afield: more info from www.vinsduroussillon.com. In no particular order, apart from colour/style and when they were opened... Search through the 'Winery A to Z' (right) for lots more wines from most of these wineries. 2008 Collioure Cornet & Cie (Cave Abbé Rous, mostly Grenache gris, Roussanne, Marsanne, Vermentino 14%) - the second time I've tried this wine and I can't really get on with it I'm afraid: perhaps less oaky than I remember and juicier, oilier and more mineral although still rather toasted; powerful with a touch of crispness on the finish, but it's quite charred too vs not enough "fat" for me. Mind you, my neighbours liked it so there you go. €11.50 cellar door, £8.99 M&S (from November). 2008 Muscat de Rivesaltes Château L'Esparrou - hmm, I don't get it: I've tried much better Muscat de Rivesaltes than this! When first opened, a bit odd, simple and "chemistry lab" (sugar, alcohol, aromas...) without really coming together. But it got better with aeration turning into, well, a rather heavy sweet Muscat... €8 cellar door.